Low Cost Gift Cards and Promotional Cards, Environmentally Friendly. Card Size: 3.5" x 2"
Promotional cards are an important component for any marketing campaign. Use the cards for customer retention by adding on the card an offer for the customer's next visit. For example: "$5 off on your next purchase of $50". You can also put a discount offer on the card and have your employees hand out the cards to customers that are leaving the store without a purchase. Print the cards with the ability to be marked, stamped or punched and the card becomes a perfect loyalty card for your loyalty program. Cards can be used as fixed value gift cards. 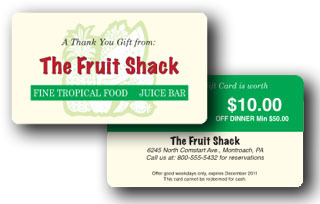 With your design, logo and/or store imagery the card becomes a custom gift card promoting your business. Printing these cards is economical and fits any marketing budgets.